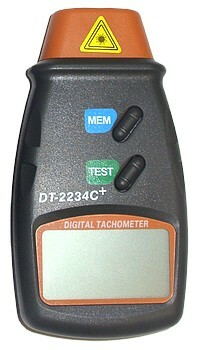 The DT-2234C+ is a hand-held digital optical tachometer for non-contact measurement of rotational speed (RPM) or frequency. Each unit comes with its own calibration certificate, which reports the measurement error of the unit at 2 points across its range. The calibration certificate for each unit is in accordance with BS EN ISO 10012:2003 with direct traceability to National Standards. Resolution: 0.1 RPM (2.5 - 999.9 RPM), 1 RPM (1,000 - 99,999 RPM). UKAS calibration is optionally available on this product, as well other optical tachometers, please contact us for details.